Growing onions from seed can seem a little intimidating, but it's really not much fuss at all. For years I just settled for whatever onion sets were available from the hardware store, but I've become an onion seed believer. Now my first seeds planted for the season are my onions, and the boys and I grow several hundred of these beauties every year, many of which go into homemade salsa and spaghetti sauce. 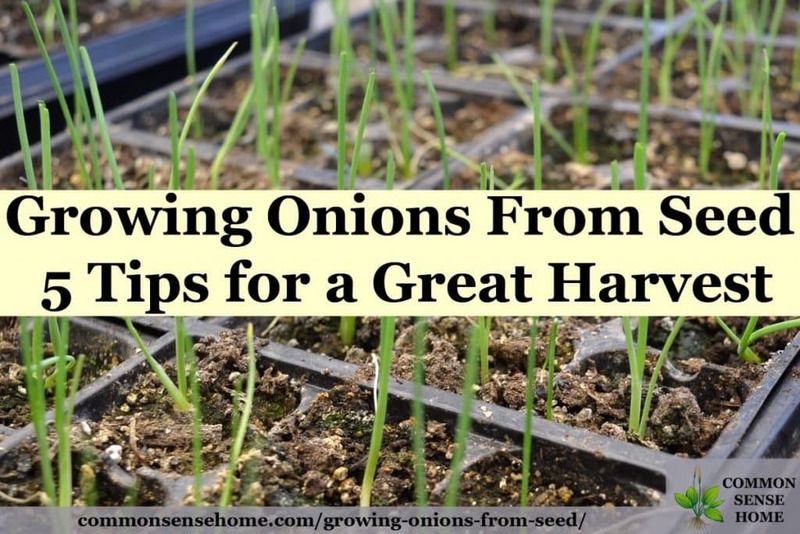 In this post we'll cover how to grow onions from seed, picking the right onion varieties for your area, onion seeds versus onion sets, and five tips for a great onion harvest. 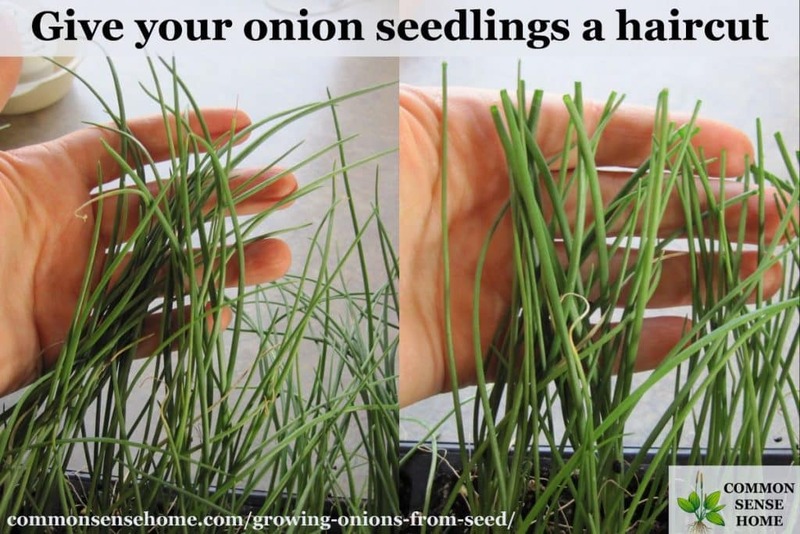 You can grow onions from seed or from onion sets. We review both ways of growing onions below. These instructions work for white and red onions. There is also a section on the types of onions for warmer areas. If you're in a milder area, you may be able to get away with starting onion seed directly in the garden, but for those of us that have a real winter, onions should be planted inside 8-10 weeks before your last frost date in spring (earlier is better). Onion plants take around 100+ days to mature, so you'll need to better part of 4 months to get full grown onions, although the bulbs can be harvested before they are fully mature. Choose a container with good drainage and enough room for around 3 inches of dirt. I use recycled seedling packs from the nursery, but you can also use recycled plastic tubs from salad or fruit, wooden growing trays or even cleaned fast food trays. Fill your container with damp potting soil (I've been using Fox Farm organic potting soil), and mark furrows or divots for your seeds – about 1/4 – 1/2 inch deep. Sprinkle seeds along the furrow or place 1-4 seeds in each cell/divot. Cover seeds with soil and gently tamp down. Mark trays with variety and planting date. Cover seedling tray with plastic cover or plastic bag to conserve moisture and place in a warm location (70-75°F (21-24°C)) to stimulate germination, such as near a wood stove or on the top of the refrigerator. I like to use a seed starting heat mat under my trays. Onions may take a while to sprout, so be patient. 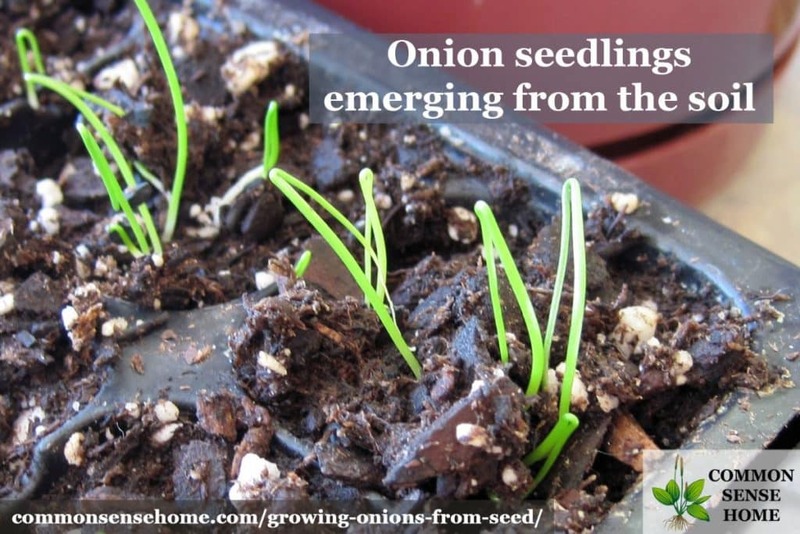 Once the onion seeds have sprouted, remove the cover and place it a well lit cooler location, such as a south facing window or under grow lights. I keep mine on my home built seed starting shelves in a corner of my basement. Keep soil moist but not wet – no standing water! To give your onions extra TLC, water with a natural liquid fertilizer such as fish emulsion, manure tea or compost tea every two weeks. Give your onion seedlings a haircut! As they grow, your baby onions will want to get skinny and flop over into a tangled mess. To grow sturdy plant with strong root systems, use a scissors (or just pinch them with your fingertips) to keep the plants trimmed to around 3 inches tall. (I let them get 4-5 inches as it gets closer to transplanting time.) The trimmings are perfectly edible. I usually toss them into salads or soups because they are quite delicate. Each day, add a little more time outside, until they are outside full time. When it's time to move the onions to the garden, prep your planting area by making sure it is weed free, well-tilled and amended with the organic matter of your choice (aged manure or compost, or worm castings). Plant them when the soil is warm and frost is unlikely, planting a bit late has generally provided us larger onions then trying to get them planted early. I prefer to plant my onions in triple rows in a grid pattern, with roughly a handspan between plants. Eliot Coleman suggests planting in blocks of four seedlings, with wider spacing between the groups of four (6-7 inches). The onions are supposed to push away from each other as they grow, and it's supposed to make weeding easier. I have tried this a couple of times, and my grouped onions always came out smaller than my spaced onions. If you have tried the group planting with good results, please let me know. Gently remove your onion seedlings from the planting tray and tease them apart, taking care not to damage the roots. Snug the seedlings into the soil in your desired planting pattern. Water gently to remove air pockets around the roots. Enjoy your onions fresh out of the garden, or prepare them for storage when mature following the directions in the post, “How to Harvest, Cure and Store Onions“. Work up your planting area to at least 8 inches deep, and amend with aged compost or manure or worm castings. When the soil temperature reaches 50F (10 C) in springtime (or cools down in fall), sew one to three seeds per inch (2.5 cm), 1/4 to 1/2 inches (6-13 mm) deep, in rows 4 inches (10 cm) apart. Begin thinning the seedlings when they reach around 2 inches (5 cm) tall. For green onions (scallions), thin to 1 inch (2.5 cm) apart. For larger bulbs, thin to 4 inches (10 cm) apart. Thinnings may be eaten or transplanted (if the roots are intact). Which are better – onion seeds or onion sets? 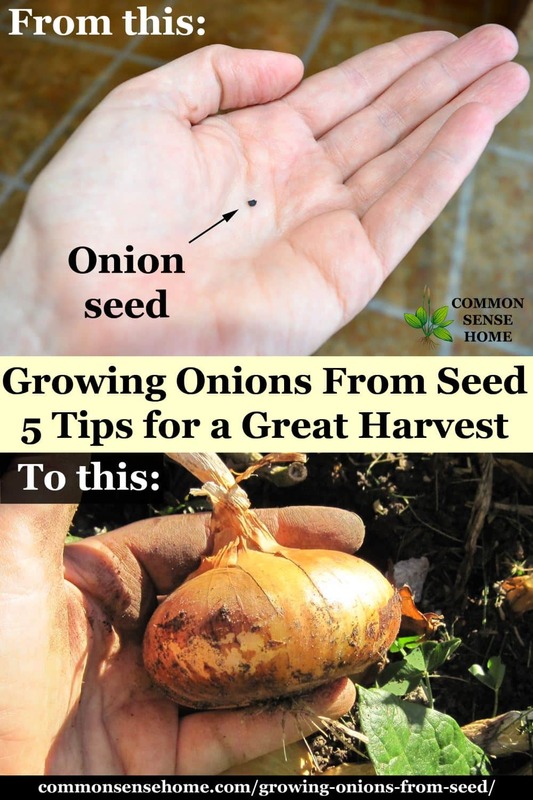 You can grow onions from sets or seeds. First we will explain the difference between seeds and sets. 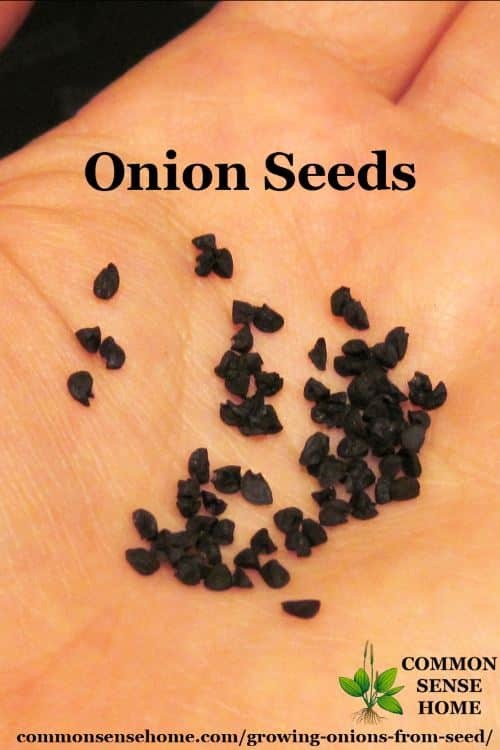 Seeds are exactly that – they are seeds collected from the flowering tops of onions. Onions are a biennial, so they normally produce seed in their second year – unless they are stressed out and bolt to seed in their first year. Onion flower ready to set seed. Onion sets are miniature bulbs grown from seed the year before. 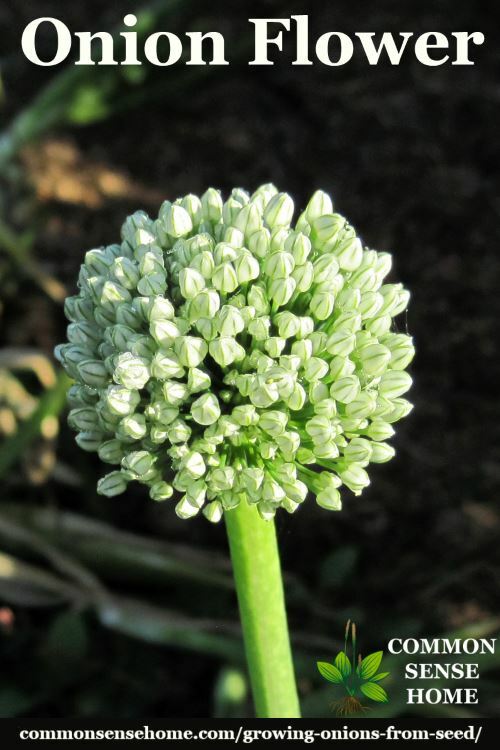 If you choose to plant onion sets, go for the smaller ones, as the larger sets may be more likely to already have a flower stalk and bolt to seed. While there's nothing wrong with using onion sets (my mom often did), I enjoy growing from seed because I have so many more different varieties to choose from, and they tend to store better and grow larger than my onions grown from sets. Long Day Onions – generally recommended for northern growers, long day onions need about 14 hours of daylight to form bulbs. Planted in spring, nature in fall. Bulbing is triggered after the summer equinox (June 21) in most northern areas. Short Day Onions – generally recommended for southern growers, short day onion varieties need roughly equal amounts of darkness and light to set bulbs. Planted in fall, mature in spring. Day Neutral or Intermediate Onions – will form bulbs regardless of the number of daylight hours. Planted in spring in the north and fall in the south. 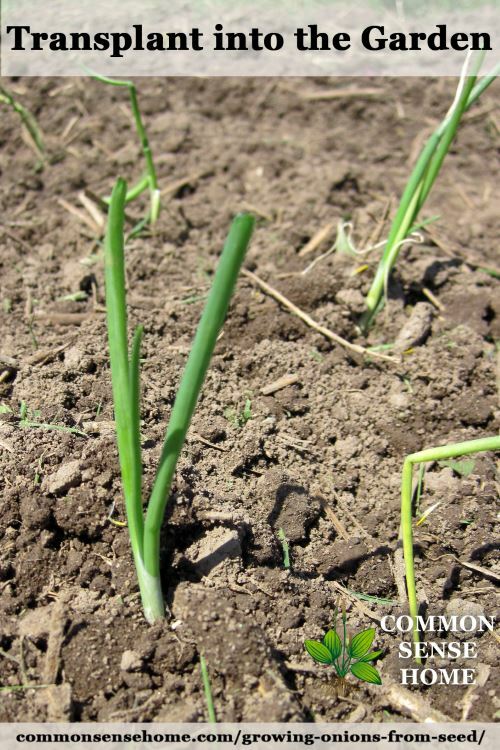 If you're not sure what to plant, find out what type of onions are best for your area by contacting your local Cooperative Extension office. Make sure your onions get plenty of water. Onions tend to be shallow rooted, so they need regular rain or hand watering – BUT – stop watering about 2 weeks before harvest in fall to let them start drying up for storage. Keep weeds in check for bigger bulbs. I let my weeds grow a bit in some areas of the garden (because we eat them or use them for medicine), but not in my onion patch. Because of their shallow roots, onions are not great weed competition. Use mulch (which also conserves moisture) or shallow cultivation to reduce weed pressure. Use companion plants such as deep rooted carrots, turnips or beets to help bring up water and nutrients; or pair onions with spinach since they both tolerate cool temps and the spinach can spread between the onion rows to keep down weeds. Onions also make good companion plants to the nightshade family (tomatoes and peppers) and the cabbage family. Don't use old seed! Onion seeds do not tend to maintain germination rates well in storage. I try to use fresh seed each year, or one year old seed at the oldest. By the second year, germination rates drop through the floor. Don't overdo the nitrogen! Too much nitrogen (in the form of fresh manure, for instance) will grow big green tops and small bulbs. You can side dress with some compost in spring, or water with a diluted fish emulsion or other balanced liquid fertilizer once a month, but don't go crazy. And that's it – just keep them weeded, fed and watered, and in a few months you'll have a feast of home grown onions. Remember once you have grown them you need to store them, read the following post for directions, “How to Harvest, Cure and Store Onions“. It’s my first time of making onion seedlings and it’s going better than I was expecting. The seedlings reached about 2 inches now and I can’t wait for transplanting them outside in the garden. Thank you for sharing this great and helpful information. Happy gardening! Yeah! Glad you tiny plants are doing well. How/When do you collect the seeds from the flower bulb? Collect the seeds when the flower heads are dry. As they approach dryness, you may want to snip them off into a paper bag or bin and let them dry completely. The flower heads will become quite brittle, and the tiny seeds like to go everywhere. Letting them finish drying in a paper bag (or open top bin with closed bottom and good air circulation) ensures that the seed will drop where you want to collect it. If I want to plant onions in the tropics, should I plant them directly? Hi Alfred! My name is Amber and I live in South Carolina on the coast. Our zone is 8b and very humid. Although I have never planted onion from seed (I always buy bulbs) I can offer my experience as our climates may be similar. We plant onions in fall and in late winter-early Spring. They like full sun and nitrogen rich soil. Ours do best if planted in cooler weather and are ready to harvest as the weather warms up. We rarely get below 20° F and our Springs get hot fast. If nothing else, you can at least harvest the tops! Best of luck to you.